This first-rate onion is strong growing and will produce a heavy, early maturing crop, even in our indifferent British summers. An even skin colour and uniform globe shaped bulbs, together with good keeping ability make it an ideal show bench subject. RHS Award of Garden Merit winner. 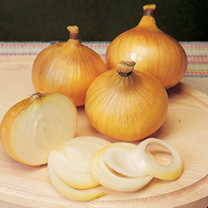 Onion sets are immature ‘bulbs’ in an arrested stage of growth. When planted they begin to grow again, becoming full size onions by late summer. Rarely attacked by pests or diseases they will thrive in quite ordinary conditions. Choose a well-drained sunny position with reasonable soil. Plant by setting bulbs 15cm (6") apart in rows 30cm (12") apart with the small bulbs tips showing above the soil surface. 250g of sets (approximately 60 sets) will plant a row of approximately 6m (19').